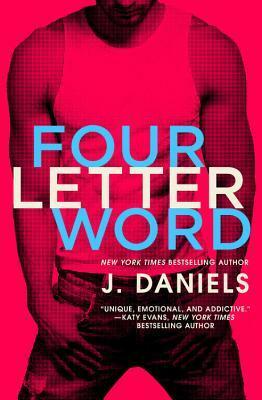 First, let me say a huge thank you to J. Daniels for sending me a copy of Four Letter Word for an honest review! Alright, so this book definitely has a lot going on! There are twists, scenes you totally expected, and so much more in between! When I started this book, I was foretold that it was a mix of reviews, and that there weren't too many people that absolutely LOVE it, but I must say it was really good! I went into it with certain assumptions, but came out really loving it! First, I'm just going to rip off the band-aid and tell you what I didn't love about the book, just because I would rather you know what's up before I get into a whole lot of loving!! So when I started this book, I definitely got the feeling that Brian wasn't going to be the most favoured. I found myself at certain times of his dialogue really turned off by what he said, although it didn't last the entire novel. Once I finished it, I also thought that it could have been a bit shorter. There were certain parts in the novel that seemed kind of slow, or that the romance aspect was "Instalove" and I felt like it didn't fully work at moments. Alright, so moving on, let me tell you that when things got going, they didn't stop!! About half way through the book, I found it to really pick up and I couldn't stop reading!! First, the bond between Sydney and Tori is honestly goals! Always there for one another and not going to take either one's bull and will totally tell it like it is! And I mean who wouldn't want to live with their best friend?! So at the very beginning you get a real sense of who Sydney is and the amount of "Guts" she has when she truly gives it to the person on the other side of that phone! I don't think I've laughed so much reading that, and had to read it over more than once, because it was so intense! As you get further into the novel, you really get a sense of both Brian and Sydney, and you really see how much pain they both have gone through. I definitely got caught in the feels between these two, that you really couldn't help but feel their pain, and really get that heart dropping moment that kind of really captures their backstory. I just need to take a moment and just say WOW! I swear the entire time that this story was going on, I was on the edge of my seat just WAITING for the other shoe to drop and for something terrible to happen, or have a specific character make an entrance, but I should have known what was going to happen, but I wasn't ready for it! AT ALL!! "Love was a risk. It was wild and unpredictable. You could either hold on for the ride, not knowing how it would end, or you could let go and never know the amazing things you could've had." I'll admit that this romance was not like anything I've read before! There were so many ups and downs, I wasn't sure how it was going to end, and totally feared the worst! There's another scene like right at the end that I couldn't believe and literally yelled into the book like WHYYYY!!!!! So there were a lot of quotable moments in the book, but some that captured my eyes were some pretty great ones! "Sometimes family isn't made up of who you're born to or who you share a name with...Family are the people who support you and love you no matter what." "You were hurting so bad but you shut that out so you could heal me." "I can't keep hoping and holding out, waiting for you to give me what I need." Overall I really enjoyed the book! I personally found that it could have been shortened, and that certain aspects could have been maybe less rushed, but once you got at least half way, things really picked up and you couldn't stop what was going to happen! One word that I can explain a lot of this story would be CROSSWORD (It'll all make sense when you read it!) There was a lot of pain showcased in this novel, which I really loved, because it got raw, and powerful. SO much emotion and feels running through, just wait until the very end, and you may be on the same boat as me wondering if there will be more from them! That's all for my review of Four Letter Word! I hope you enjoyed it, and I definitely would recommend checking it out! !